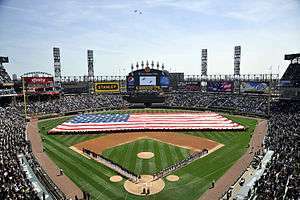 The 2010 Chicago White Sox season was the organization's 111th season in Chicago and 110th in the American League. The Sox opened the season against the Cleveland Indians at home on April 5 and closed the season also against the Indians at home on October 3. They finished the season with an 88–74 record, in second place in the American League Central, six games behind the division champions Minnesota Twins. On the Opening Day, the White Sox shutout the Cleveland 6–0. On that day, Mark Buehrle made an astounding play when he hurried and picked up a ball with his glove in foul territory and quickly underthrew backwards with his glove to Paul Konerko, who caught the ball with his bare hand to force out Lou Marson in the fifth inning for the second out. On April 12 at Blue Jays, the Sox snapped their ten-game losing streak in Rogers Centre and took the first victory since June 1, 2007, beating the Blue Jays 8–7 in 11 innings. In the next two games, Carlos Quentin hit the White Sox's first grand slam of the season, beating the Jays 11–1. The Sox split the four-game series with Blue Jays. On April 16–18, the Sox got swept by the Indians in Cleveland for the first time since May 30 to June 2, 2003. On April 23 against the Mariners, Andruw Jones hit two home runs on his 33rd birthday including his walk-off home run which made it 7–6. On the next day, in the top of the ninth inning, Casey Kotchman hit a soft ground ball down the right field line and a fan reached over and pick up the ball with his bare hand in foul territory. This is a fan interference ground rule double which two men scored from first and second making it 4–2 Mariner lead. Then in the bottom frame, the Sox scored three runs via two home runs, one by Paul Konerko (solo shot) and a walk-off by Alex Ríos (two-run homer), which made it 5–4. On the next day, White Sox swept the Mariners at a score of 3–2 with Paul Konerko's GW home run in the eighth inning. Paul Konerko broke the franchise record for most home runs hit during the month of April with 11. However the Sox finished the month with a not-so good record of 9–14. April (9–14) – home (6–6) – road (3–8) – 92 R.S. 111 R.A.
May (13–14) – home (5–7) – road (8–7) – 118 R.S. 127 R.A.
June (18–9) – home (9–6) – road (9–3) – 125 R.S. 103 R.A.
July (18–8) – home (12–1) – road (6–7) – 140 R.S. 84 R.A.
August (14–15) – home (6–7) – road (8–8) – 155 R.S. 130 R.A.
September/October (16–14) – home (7–9) – road (9–5) – 122 R.S. 149 R.A.
Wikimedia Commons has media related to 2010 Chicago White Sox season.